Cherry Lips Blonde Curls: Music & Martini's with a Dash of Roses! | Giveaway! Music & Martini's with a Dash of Roses! | Giveaway! 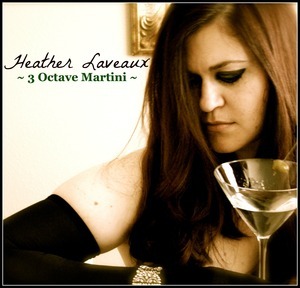 The other day she introduced me to this wonderful singer Heather Laveaux who is coming out with her debut EP (Extended Play) CD, "3 Octave Martini". It's jazzy...very retro...in fact, one of my fav songs of Heather's is "Why Don't you Do Right" (A Peggy Lee Cover song) ...so smooth...makes you want to put on a ravishing dress and go sip a martini. You can check out her website here peeps to listen to some tunes and purchase her CD "3 Octave Martini" which also happens to be available to buy on ITunes and Amazon! Booyah! You can listen to her music at these sites as well Reverbnation and SoundCloud! But first, before you click to these other wonderful blogs, you have to enter our giveaway! Oh, snap! Heather is giving away one of her EP "3 Octave Martini" CD's via our blog and to put the cherry on top we're also adding one of our Racy & Risque Rosie Lip Balms! Giveaway starts Tuesday June 19 & ends June 22 this Friday Midnight EST. Leave a separate comment for each entry below dolls and guys. There are 7 ways to enter! Good luck peeps! 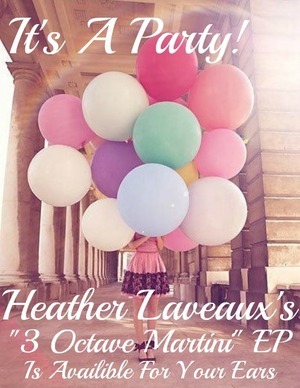 The lucky winner will receive Heather's EP "3 Octave Martini" CD mailed directly from Heather and will win one of our Racy & Risque Rosie Rose Lip Balms directly from us! The winner will be chosen through Random.org. We'll contact you via email (so make sure to include your email in your comments!!!!) & you'll have 48 hrs to respond to receive your prize. Entry #1: Follow Heather Via Facebook. Entry #2: Follow Margarita Bloom via Facebook. Entry #3: Follow Heather via Twitter. Entry #4: Follow Margarita Bloom via Twitter. Entry #5: Follow Heather via Myspace. Entry #6: Follow the Margarita Bloom Blog here via Google Friend Connect. UPDATE!!!!! And we have a winner! Followed MsLaveaux on Twitter, liked her darling page on FB.. already following the lovely MB's tweets, blog & FB page. Now here's?my one entry comment. On my way to tweet about it. Who doesn't love sultry new music, rosy lips & a party?